Looking for that perfectly moist gluten-free pumpkin bread? Here it is! Comforting, tender, and full of pumpkiny goodness, this gluten-free pumpkin bread is a Fall staple in our house and great for gluten-free entertaining. Move over Starbucks, there’s a new pumpkin bread in town! 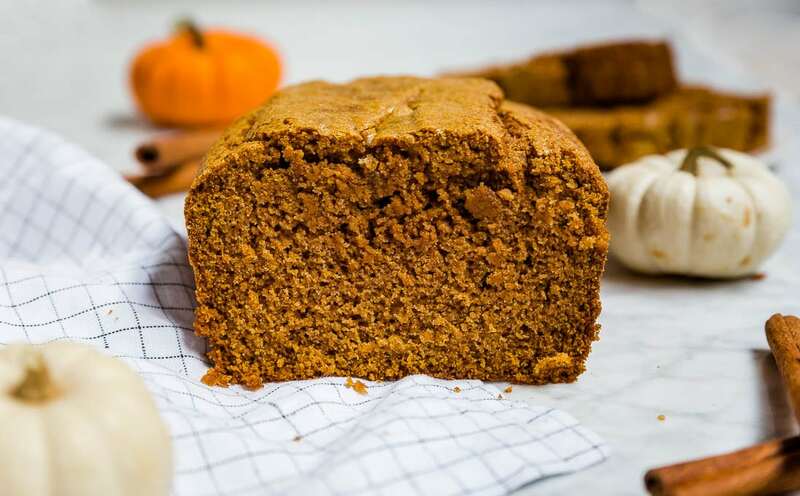 Would it really be Fall without pumpkin bread? Imagine a warm slice of pumpkin bread, slathered in butter (or dairy-free butter), with a drizzle of honey or maple syrup? Perfection! Just cut me a slice and hand me a cup of coffee and I’m in heaven. Pure pumpkin puree, cinnamon, nutmeg, ginger, cloves. All the Fall essentials. I’ll admit.. I’m not a pumpkin pie fan. I know.. GASP! Instead of pumpkin pie, it’s pumpkin bread that does it for me every Fall. It’s comforting, warming and great for sharing with friends! In fact, I have some in the freezer now waiting for my sisters to come by tomorrow to share with them. This recipe makes one loaf of gluten-free pumpkin bread, but you can easily double it to make more. Or better yet, make mini loaves instead to share with friends and family. Gluten-free pumpkin bread is a must-have on your Fall brunch table. It’s so easy to make, too! This is a one-bowl recipe, meaning all of the mixing is done in just one bowl! No need for separate bowls to mix your dry ingredients and your wet ingredients. First, I whisk together all of the dry ingredients, and then add the wet ingredients in the center and whisk away. The batter is thick, but still able to be stirred with a whisk, or a wooden spoon or rubber spatula if you prefer. Then, spoon it into your loaf pan and bake! Quick breads, like this pumpkin bread, do take awhile to bake in the oven. However, it’s time well spent. You’ll get a hearty, yet moist, pumpkin bread that makes breakfast time SO much better. Plus, the smell while it’s baking in the oven is absolutely divine! There is a very, VERY notable part of this recipe that is SO simple but makes such a huge impact on this bread. The sugar topping. I love to sprinkle just a little bit of sugar on top of my pumpkin bread just before baking and it creates this sweet, crunchy crust that tastes like a cookie. 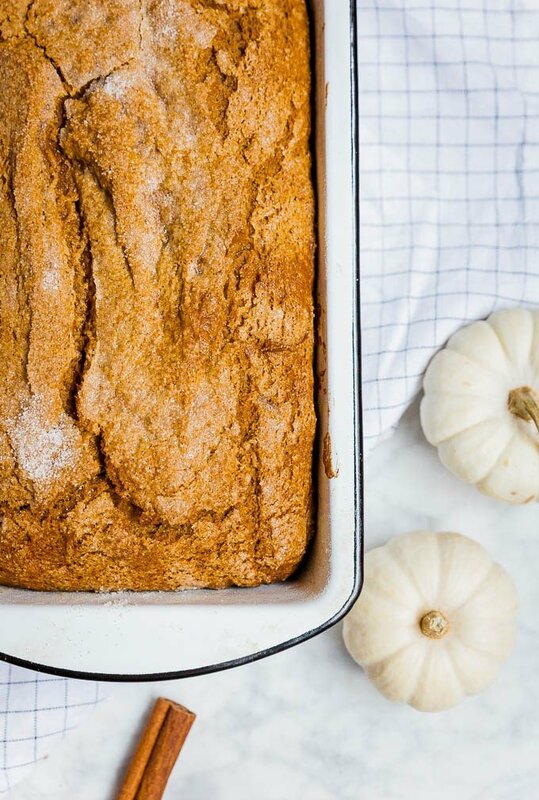 It takes this gluten-free pumpkin bread to the next level. DO IT. Please? There are so many ways you can top this gluten-free pumpkin bread. So many that I’ve been dreaming up all the ways and had to share them with you. Oh the list can go on! Check the bread about 10 minutes before the baking time stated. If it looks like it’s browning too fast, top it with aluminum oil. Check the doneness of the loaf by inserting a wooden skewer or knife into the center of the bread. If it comes out clean, it’s done! If not, leave it in longer. The time stated is a guideline as all ovens are slightly different. Allow pumpkin bread to completely cool before slicing. In fact, I’ve found this pumpkin bread slices easier and tastes even better the second day. You can store the gluten-free pumpkin bread at room temperature for 2-3 days. Keep it wrapped in plastic wrap or in an airtight container so it doesn’t dry out. You can also wrap it in plastic wrap and store in the refrigerator for about a week. Just slice and eat cold or rewarm as desired. I love to freeze my extra pumpkin bread for busy weeks or last minute entertaining. Wrap in plastic wrap and freeze for up to 3 months. Make sure it’s wrapped well so there is no freezer burn. Thaw at room temperature overnight before serving. If you love breakfast but are always on the go then try these Gluten-Free Pumpkin Breakfast Cookies. Filled with pure pumpkin, gluten-free oats, and crunchy pepitas, there’s pumpkin flavor in every bite. If you haven’t tried a savory pumpkin recipe, then Pumpkin Apple Cider Turkey Chili is the perfect recipe to start with. Can’t forget these fluffy Baked Pumpkin Donuts that are both gluten-free AND vegan. They take just about 20 minutes to get on the table. A gluten-free vegan pumpkin cupcake is always a winner for Fall parties, don’t you think? Cream cheese and pumpkin are such a delicious flavor pairing! If you want another quick dessert recipe, try this gluten-free pumpkin mug cake. It only takes about 4 minutes to make! 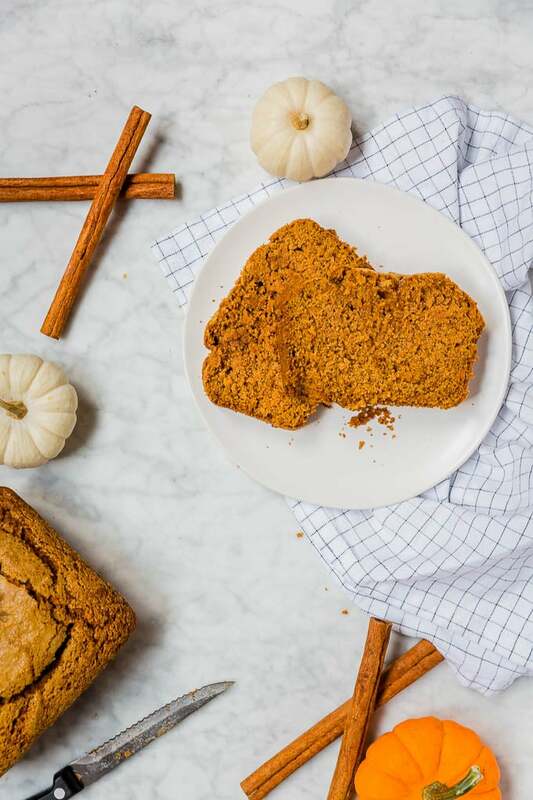 This gluten-free pumpkin bread is the epitome of Fall – full of pumpkin and warm spices, like cinnamon, ginger, nutmeg and cloves. All it takes is one bowl to whip up this quick bread and pop it into the oven and be amazed as your kitchen smells of Autumn. Slice and serve for a gluten-free breakfast or brunch. Looking for that perfectly moist gluten-free pumpkin bread? Here it is! Comforting, tender, and full of pumpkiny goodness, this gluten-free pumpkin bread is a Fall staple in our house and great for gluten-free entertaining. Move over Starbucks, there's a new pumpkin bread in town! Preheat oven to 350F. Spray a 9x5-inch loaf pan with cooking spray or lightly butter (or with dairy-free butter) the bottom and sides of the pan. Use the teaspoon of gluten-free flour to coat the bottom and sides. Set aside. In a bowl, whisk together gluten-free flour blend, baking powder, baking soda, cinnamon, nutmeg, ginger, cloves and salt. Then add in the granulated sugar, eggs, pumpkin puree, vanilla and vegetable oil. Mix until combined. Pour into the prepared loaf pan. Sprinkle 2 teaspoons of granulated sugar over the top of the pumpkin bread batter. Bake at 350F for 45-50 minutes, until bread is fully cooked through. Check by inserting a wooden skewer into the center of the bread. If it comes out clean, the bread is ready.